Eco? I don’t know. Why do you ask? Because mom wants me to write a post for her about eco. I have no idea what that is, so I don’t know what to write. How did mom come up with that word? Not sure. Maybe she was drinking her happy juice again. I heard mom mention another human named Linda G. Hill, but I don’t know what that has to do with anything. She’s so cryptic…I have to decode everything mom says. Humans speak a weird language. Ziva, all we ever say is Meow ten different ways. I wouldn’t speak unkindly about the human words. I suppose, but I still don’t know what to write. This will be recorded for posterity and I don’t want to sound dumb. Do you want me to comment on the word dumb? Okay then. Why don’t you take a nap and reconnect with your inner cat? Like you always do. Maybe you’ll dream about eco-whatever and then you can say something that’s intelligently made up. Hmmm…that might work, except mom said it had to be done by Saturday morning. I don’t have time to nap. Gibbs! I didn’t ask you to be snarky. You’re supposed to be helping me, not making fun. Well, okay. I can help. I have experience in these matters you know. Really? When you write for mom, you only talk about cat stuff – pooping, eating, playing, and pooping. You never get word assignments. Can you write about socioeconomics? What’s with the ten-cent words? No. I’m going to nano you in a minute. You mean like when you chase me off the couch or out of the cardboard box or out of my basket, and then chase me around while I growl and hiss at you? No, I don’t like those differences. Is that like a cheap litter box? You’re not fooling me, Gibbs. That’s a made-up word. I think that’s what mom is doing tonight. She’s sitting on the couch and not moving. I hope she gets up later to feed us. What is up with her lately and the feeding times? Mom’s been coming home really late, like when I’m starving and on my last dying breath. The week before, she was home all the time and feeding us properly. I want to go back to that. Mom wants to go back to that too. You forget that she’s working to put a roof over our heads, food in the dishes, and the toys that are strewn all over the floor. Non-appreciation of her dedication to us is unbecoming, Gibbs. Don’t “whatever” me. Mom spent a lot of time and money on getting you healthy and making sure you stay that way. Don’t be a narcissistic jerk. When you think only of yourself. Whatever. Hey, when is mom going to feed us again? Oh boy. I think we’re done here Gibbs. Did you come up with something to write? Yes. I recognized that my story just wrote itself. So when do we eat? 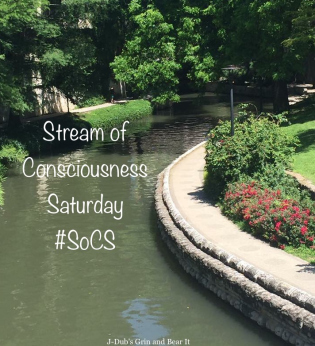 Stream of Consciousness Saturday is the freewheeling idea from author Linda G. Hill. Every Friday, Linda provides her followers with a prompt. It can be a word or words and sometimes bonus points are involved (my favorite). Linda asks us to write without editing, other than correcting spelling errors. Like a babbling brook, ambling stream or running river. Click HERE if this type of writing floats your boat or helps with your decision-making process. This was so much fun to read, Mary! I hope Ziva gets an extra snack, it looks like she’s got your back with his majesty. I do think you captured the cat mentality. On a serious note, are you working long hours for the move, or is this normal stuff? I can’t hurt the messenger when he’s helping with our office move. I have to forgive this one time. Have a wonderful weekend. Did you get any snow from the east coast storm or is it just cold there? Toronto is in this funny location that storms seem to often just go around us. While north and south of us got battered with snow, we didn’t. We’re expecting the cold snap to break tonight and temperatures to rise to around the freezing mark. It will be much appreciated! I gave up dairy, Marian, but I’ve had such a craving for mac and cheese…found a recipe that reduces the cheese and adds pureed squash. Can’t wait to have supper tonight! I will definitely give the kids some extra playtime this weekend. They deserve it and need it! I just found Daiyo brand vegan “cheese”. The cheddar really tastes like cheddar, and it melts beautifully! I’ll have to try that next time. I’ve tried some other vegan cheeses and didn’t like them at all. I love it, excellent job on eco! Your economy with words is brilliant! You killed it, Mary. What a fun post. Hello, this is Ziva. Glad you enjoyed this, but please stop killing my human. I need her to feed Gibbs so he shuts up. Thanks for clarifying, John. Ziva has retracted her claws and is busy sleeping and snoring. I love how you’ve captured the Gibbs and Ziva’s distinct personalities. Enjoy that mac and cheese with the squash. I have to try that. Thanks JoAnna. Those two make quite the pair to keep under control! It’s a hard life when you have to choose between a soft bed and food. You might have to physically remove her from the bed and put her in front of the food dish. Throw a little cheesy mac in there and maybe that will tempt her. Just as well I’m not blogging any more – stream of consciousness writing would see my posts going over ten pages. Wouldn’t be able to stop. 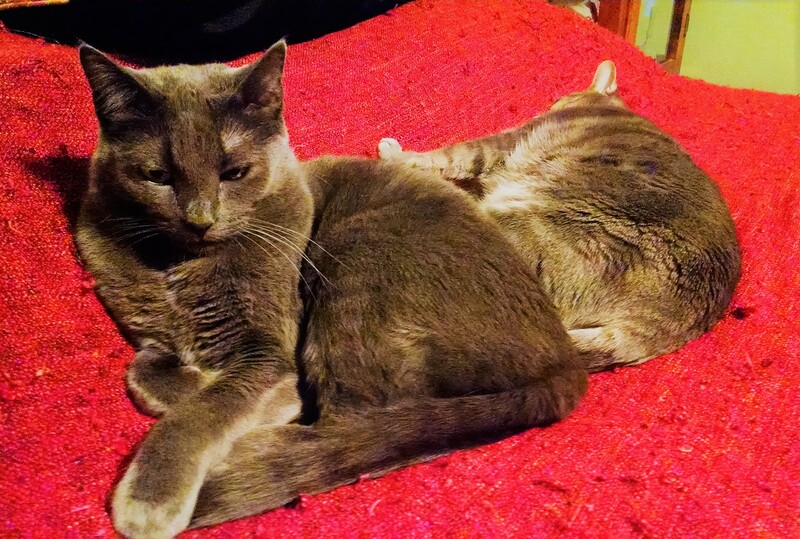 Gibbs and The Queen reign supreme (almost rhymes !) still, and their Mom too. I miss your blogging, but I understand when other things become more important. It’s put a smile on my face that you’ve come to visit today and the kids are happy to know you still admire them. Hugs M-R! You never mentioned that you were raising genius cats?! This was wonderful. Not to worry, Gibbs. Food shipped. Peek out the window in about 30 minutes. I sent it express. Shhh….I hear your mom lurking around…. I love you bird lady! It’s a tough theme, Mary. Love these kitties. Gibbs and Ziva can handle “tough” it seems. Next time I need help with a prompt, I know where to go. I recommend decommissioning Ziva as a post recounter even if prerecorded. Such precociousness. Secondly, preconceived recollections really just become unrecognisable decoration and should be reconsidered. In any case, I hope they gave you a decorous homecoming. Sorry to be a latecomer with the comment. If I switched the names here, I could totally see this post coming from our two furry lovelies… JuJuBee is especially upset that her boy has had to return to school this week and hasn’t been around to curl up and cuddle her. Poor JuJuBee! I hope she’ll find comfort in the boy’s return after school and a comfy place to sleep during the day. The kids will definitely get hugs and catnip mice…thank you!